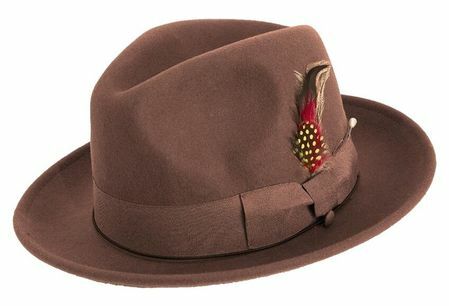 This brown color fedora hat features stiff wool felt with a satin lining, leather headband and like all fedora hats a pinched crown and finished brim. Matching colors of Mens Suits can be found here. If you're looking for a mens turquoise color dress hat, you should strongly consider getting a turquoise color godfather hat from ContempoSuits.com. It's the brim hat for men who have style with their fashion attire.